High quality zinc plated steel and stainless steel threaded inserts. Press-in self-anchoring inserts manufactured from high quality stainless steel. 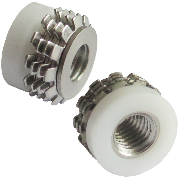 These inserts have a plastic bush, an internal thread stop and have flexible stainless steel crowns designed to anchor into very hard materials including granite, marble, Corian®, HPL and glass. 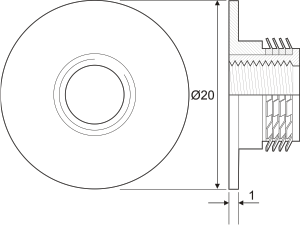 Minimum wall thickness is for reference only and it is advised to perform assembly tests.